A friend once asked Elder Bruce C. Hafen, "If Jesus Christ is at the center of the gospel and the center of the temple, why doesn't the temple endowment teach the story of the life of Christ? What's all this about Adam and Eve?" After thinking about this provocative question, Elder Hafen concluded, "I have come to believe that the story of Christ's life is the story of giving His Atonement, and the story of Adam and Eve is the story of receiving His Atonement—and their story is our story." In The Contrite Spirit, Elder and Sister Hafen use the lens of the temple to share their insights about receiving the Atonement of Jesus Christ, shedding further light on the central doctrine of the gospel while deepening our understanding of temple ordinances. As we further explore the Atonement based on the covenants of the temple, we will better understand how the Atonement applies to us. CLICK HERE to download the Day by Day sheet music. Once I started reading this book I could not put it down. Some books feel like I'm eating spiritual twinkies, but this book felt like a seven course meal! I enjoyed it so much I purchased the audio version. The Hafens do an incredible job of reading their book. Many of the insights they share have changed what I think about as I worship in the temple. I listened to this using Bookshelf Plus. I loved that the authors read this themselves. They shared experiences and insights to how the temple ordinances really are all about the atonement of Jesus Christ. They shared experiences and stories to demonstrate how life changing the Saviors atonement is in peoples lives and how the temple helps not only understand that -- but helps in our own transformations. This has become one of THE best books I have ever read! I have listened to it at least 10 times it is that good! I love the fact that it is narrated by the authors. I almost feel like I know them personally even though I've never met them. The principles, insights and stories will forever hold a special place in my heart. I reflect on them often as I am dealing with the most challenging time in my life. This book explains the importance of temple ordinances in clear and simple words. Elder Hafen and his wife explain the who, what, when, how, and why of our temple covenants. They also point out that everything in our Church leads back to Atonement. Each chapter connects a different aspect of the Temple back to the Atonement, and helps the reader understand the Gospel as a whole. 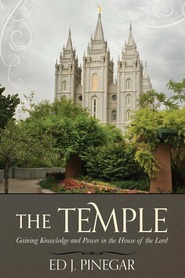 Due to the simplicity and clarity of their message, I would recommend this book as a gift for anyone who is preparing to enter the temple, or for those who don't fully understand why our temple covenants are so important. I would also suggest this book for those seeking to understand the temple, or the Atonement. The book does mention some "heavier" concepts of the Gospel, so it may be harder for those younger 16 or 17 years old to understand. This is one of my favorite books. I use it to help write talks, prepare lessons, and give family home evening lessons. A wonderful book! I would buy the book just for the beautiful Walter Rane cover art! Anything that Elder Hafen puts out is thought provoking and well written. This book is no different. As the former Temple president of the St. George temple he is well qualified to write such a book. He shares many stories both from the lives of those who worked in and/or attended the St. George temple while they were serving there about how there lives were made better by attending the Temple. He also shares many stories from church History that teach many profound truths. When I came away from the many historical stories of sacrifice, I felt a renewed sense of gratitude for my life, as well as a renewed desire to lay more on the alter of sacrifice, knowing that my challenges pale by way of comparison to what the pioneers endured. We live with many creature comforts that the pioneers could have only dreamt of and yet we sometimes complain about the difficulties of our lives. This book will help you to put your life and your challenges into greater perspective. If there is an overall theme to the book it would be that we actualize the atonement in our lives by the consistent keeping of the associated covenants. Then and only then can our Savior allows our "almost" to be enough. From reading this book you really get a sense for the "team-effort" nature of salvation. Our sacrifice(s) combined with the Savior's sacrifice together can qualify us for all that the Father hath. It's a beautiful partnership. The Savior already did his part. Will we do ours? One of my all -time favorite books. Elder Hafen and his wife Marie together are masterful teachers. Every chapter is like a pealing an onion, there are layers and layers of interrelated parts. From the moment I began reading the first chapter I could not put it down and could not wait until I got some more time to continue. Fortunately I picked up the audio version of this book as well 8.5 hours. The listener has the opportunity to listen to both Elder Hafen and his Sister Hafen read different chapters. It was such a treat to drive to and from work each day and listen and ponder each and every topic they discussed. By reading I feel I have new respect and a greater appreciate for the Lords plan for each one of his children and a greater love for Temples. I am so grateful that I have this book it quickly has moved to one of my all-time favorites and I have the desire to read it again and again. I would recommend this book and getting the audio book as well.